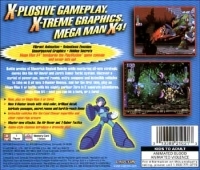 Box Text: X-Plosive Gameplay. X-Treme Graphics. 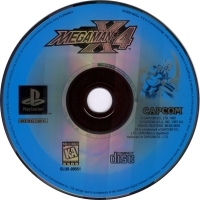 Mega Man X4! Battle armies of Maverick Reploid Robots while mastering all-new strategic moves like the Air Hover and Zero's Saber Tactic system. Discover a myriad of power-ups, secret rooms, extra weapons and invincible vehicles to take on 8 all new X-Hunter Bosses. And for the first time, play as Mega Man X or battle with his mighty partner Zero in 2 separate adventures. Mega Man X4 - now you can be a hero, or a Zero! 05-24-2016 tictac472 Box Text X-Plosive Gameplay. X-Treme Graphics. Mega Man X4! Battle armies of Maverick Reploid Robots while mastering all-new strategic moves like the Air Hover and Zero's Saber Tactic system. Discover a myriad of power-ups, secret rooms, extra weapons and invincible vehicles to take on 8 all new X-Hunter Bosses. And for the first time, play as Mega Man X or battle with his mighty partner Zero in 2 separate adventures. 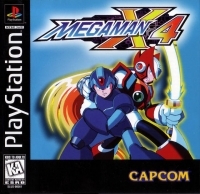 Mega Man X4 - now you can be a hero, or a Zero! This is a list of VGCollect users who have Mega Man X4 in their Collection. This is a list of VGCollect users who have Mega Man X4 in their Sell List. This is a list of VGCollect users who have Mega Man X4 in their Wish List.